The history of Chaparral, and remember we're talking Sixties here, is a history of innovation. Sure, other racing companies produced innovative cars, techniques and devices as well. Think about Lotus: monocoques, wedge shaped bodies, the introduction of wing cars in the late Seventies leading to twin chassised cars. But besides Lotus..? Many other companies or constructors had an original idea occasionally. Four engines, one engine per wheel (Hoare Mac's-it Special ), ridiculous wide but veeery low tires (Shadow) to name but a few. But mostly you could speak of slow evolution rather than revolution. OK, with a conservative design you can win races. With a common design executed uncommonly well you can even win championships. It has been done many times in fact. Jim Hall's strongest opponent, Bruce McLaren, did it this way and ruled CanAm for many years. For Jack Brabham it delivered two Championships in Formula 1. The list is endless. What Chaparral really made different was due to two aspects. One: it was a company driven by people like Jim Hall and Hap Sharp who were both talented driver ánd engineer in one person. Even chief mechanic Franz Weis was an excelent testdriver. In 1977 he still had Rattlesnake Raceway's laprecord to his name. Two: innovation and development was an essential part of their fun. That's why they had their own testtrack with photo-electric cells, a skidpad and all. Even Ferrari didn't have that kind of facilities in those days. Winning was important but if nothing broke, there was nothing more to learn. Other driver/engineers like McLaren, Brabham and Surtees were on the conservative route. And innovator Colin Chapman was not an active driver anymore when his Lotus innovations hit the track. When you take a look at starting grids pictures of the Sixties the Chaparrals really stand out in the crowd. Because of the bright white, nearly sponsorless, colour and their bizarre design features showing how advanced they were when compared with the competition. For anybody who wants to have a complete insight in the Chaparrals' impressive list of innovations I can recommand the fantastic book 'Chaparral' of Falconer and Nye. Another very good source is 'Chevrolet = racing..?' written by Paul van Valckenburgh. The latter was hard to find. It is for sale again, see literature. Denny Hulme, McLaren driver/enemy, is quoted in the first book: "When we arrived for a race the first place we would always look would be the Chaparral section of the paddock, because they were always likely to have something new to give us a hard time." So what did they come up with? The first real innovation was the GRP (glasfiber reinforced plastic) chassis of Chaparral 2 in 1963. Lotus had done something like that for their Elite road car but it was never done for a full blooded racing car. It was very strong, very stiff and reasonable light. One chassis broke in an accident but it could easily be glued together and win a race like Sebring 12 hours 1965 again! These chassis were later changed into the endurance coupe's 2D and 2F. They both won a race in Europe. Because of their driving and engineering skills, combined with their private test facility, Chaparral became Chevrolet R&D's unofficial testteam. And that's were many innovations started. Among them the famous, secret, automatic gearbox. In various configurations the concept lasted the entire decade in all Chaparrals. And from Chevrolet R&D the 2J with the ground braking ground effects system arrived as a test rigg to be developed into a proper race car. The most visual innovations were in the aerodynamics department. Endless variations in bodywork, flaps, louvres, ducts, ramboxes, etc. And of course the wings. From the low movable 'flipper' on the 2C to the high movable wings on the 2E, 2F and 2G models. Complex systems with flaps and integrated wings in the nose of the cars to counter balance the force of the rear wings. Therefore the relocation of the radiators to a position 'midships'. Another striking visual aerodynamic feature were the giant fans on the 2J 'vacuüm cleaner' with 'the Martian Bra' belt covers. In my opinion, the 2H was the most intruiging and most innovative Chaparral. Look at the 2H mystery for a story about this monster. When Jim Hall finally pulled the plug after the 2J CanAm season of 1970 it was because, in a series of very disappointing events, his best and most beautiful ideas had been banned by racing authorities. His playground had been restricted too much. It was no fun anymore. Later in the Seventies he became active in the racing scene again. With partners like Carl Haas (American Lola distributor) and Count Rudi vander Straten (VDS) he ran teams in Formula 5000, the Formula 5000 based CanAm series and USAC. Ironicaly with 'common cars prepared uncommonly well' the team won many races and championships. Read more at Racing Other Brands. After winning the famous 500 miles of Indianapolis In 1978 as a rookie team, with a Lola, Jim Hall returned with a real Chaparral 2K next year. Designed by John Barnard, it was a yellow look-alike of the black John Player Special Lotus 79 Formula 1 championship winning car of 1978. 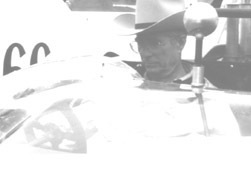 So Jim Hall was the first to bring the wingcar type of racing car to Indianapolis and the Cart Series. The 2K was leading the race until it met engine problems after 105 laps (half distance). In 1980 the 'Yellow Submarine' took the deserved win. 1981 they tried again but the car went out early with mechanical problems. It was to be the last Chaparral. No, It was not! It seems to be the case that you can buy a new Chaparral if you want. Jim Hall and old Chevrolet pal Jim Musser are building a limited series of Recreation 2E's. If your wallet is big enough look at http://www.chaparralcars.com/2e.php for more details!